Have fun and know that you don't necessarily have to follow theories of design and the color wheel to find a successful scheme. Color choices are highly subjective, and when it comes to decorating your home, you need to do what feels right to you. Resist the temptation to select a paint color first. Because paint is inexpensive and can be matched to virtually any color, start your color search with room elements that are less flexible, such as furniture, fabrics, tile, or wallpaper. Then base your paint colors on those. As you choose colors, don't forget to consider the value. A mix of values within your color scheme helps to keep a palette with multiple hues from becoming chaotic. "Choose one dark color, one light color, and one bright color," says Andrea Piontek of Olympic Paints. The color that becomes the dominant hue in the room depends on your personal preference. "Go for your comfort level," says Mark Woodman, interior designer and board member of the Color Marketing Group. "Choose clean and bright, or soft and subtle." If you're wary of color, test it first. Draw a plan of your home and list what will be in each room, such as the carpet, wall colors, and furniture. Gather swatches or paint chips that represent the colors of those items. Assess the rooms for both positive and negative attributes; write them down. Find focal points from the list of positive traits. Consider how one room will flow into the next, what mood you want, and the items to be incorporated into the palette. Plan the house one room at a time. For an easy palette, use one color in different proportions in all rooms: as a wall color in one room and accent in another. Pay attention to the impact of lighting. Color is a reflection of light, so the kind and amount of light in a room will have a significant impact on a color scheme. Experiment with how natural light or light from lamps or recessed fixtures affects color in fabrics, paint, furniture, and other surfaces. Daylight is considered the perfect light source because it has nearly uniform intensity over the entire visible spectrum of colors. Natural light changes from sunrise to sunset as the sun's rays travel through varying amounts of atmosphere. When considering a color scheme for a particular room, spend some time in the space throughout the day, taking note of how the shifting light affects it. A room with only northern exposure, for example, receives less daylight than other rooms in the home. A warm color palette would be effective there to soften shadows, and it would react well to more hours of artificial light. Incandescent lamps emit a redder and warmer light than sunlight. Fluorescent lamps, on the other hand, generally create a bluer, cooler light. When selecting colors for a room that is used primarily before sunrise or after sunset, choose the colors only under the lighting used in the room. Keep in mind that any color with white in it will reflect the colors that surround it. A white wall, for example, will take on the reflections from carpeting, ceiling color, and even furnishings. Injecting color doesn't have to mean a long-term relationship with a chosen hue. If you prefer a neutral background, there are many ways to add color with small touches or even bursts of a selected color scheme. 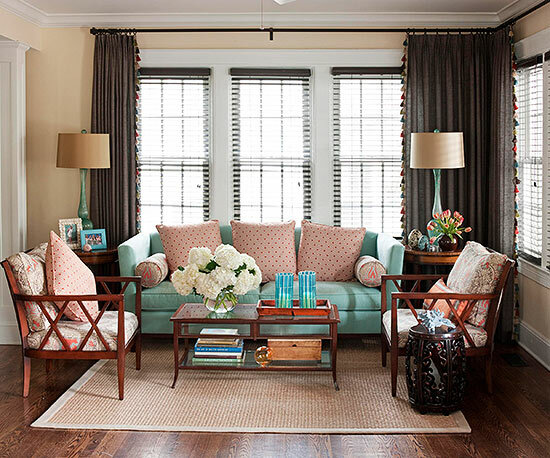 Fabrics and textiles such as rugs, pillows, throws, and window treatments are the perfect elements for inviting color in and can add pattern and texture as well. Artwork brings in color and personality at the same time. Accessories and personal collections can act as colorful accents in your room. And don't forget the lively hues of flowers and fruit. Grouped in vases or bowls, they create a colorful mass in any space. While neutrals might seem safe, there are many benefits to using color in your home. 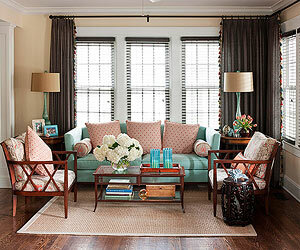 Color can unite disparate styles of furnishings. It is also useful for renewing worn or outdated furniture. Nothing enlivens a traditional style more than a fresh and unexpected pop of color. Using color can also manipulate your sense of space. A small room can seem larger with light colors; a large room will shrink with a darker shade on the walls. You can visually lower a ceiling with a dark color and raise it with a light one. Let architecture guide you. Look for corners and transition areas for natural places to stop and start a paint color or wall treatment, such as wallpaper. Pick a self-contained wall to paint with an accent color. Use a monochromatic scheme. Change the value of a color from space to space. Add molding. 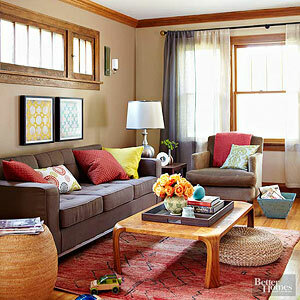 Delineate a space with molding and use paint within that space for a block of color. Choose a three-color scheme. Use one color on all the walls. Use another color on all the trim throughout the space and a third color on the ceiling. Break up endless walls. Separate a long wall with a bookcase, shelving, or screen. 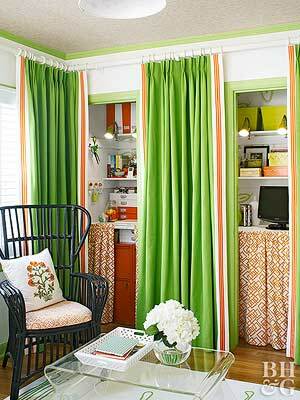 Cover the back of the casework with colorful wallpaper or a contrasting paint color. Paint or upholster the screen. Define space with rugs. A dining area might be grounded with a color-banded sisal rug, for example, while in an adjacent living area, furniture could be grouped around a multicolor wool area rug.